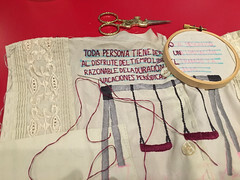 Embroidered by hand on a guayabera from Puerto Rico for the UDHR Quilt project. 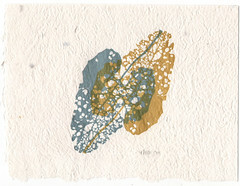 A series of prints, letterpress printed from collagraph plates made from jäkälä and polymer plates made from skeleton leaves gathered during autumn 2018 in Fiskars, Finland. Printed on handmade abaca paper. 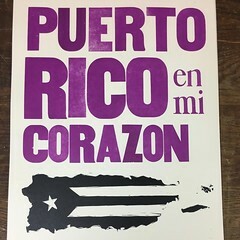 Puerto Rico En Mi Corazon is a collection of letterpress broadsides of contemporary Puerto Rican poets, in English and in Spanish. Edited by Raquel Salas Rivera and Erica Mena, published by Anomalous Press. 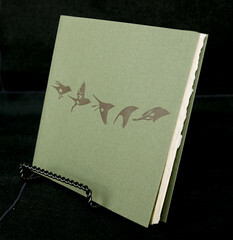 Gathering is a unique artist book made during a month-long residency at Arteles in Finland in 2015. Collage, found objects, and embroidery. Handmade letterpress printed by Erica Mena. Poems by Alma Baumwoll. Illustrations by Katie Hargrave. This book was hand-set in Palatino lead type and printed on Rives Heavyweight paper on a Vandercook SP-15 at the University of Iowa Center for the Book. Sewn in a double pamphlet with tipped on mulberry endpapers, it was made in a limited edition of fifty numbered and signed copies. Printed from handset metal type on Rives lightweight grey paper with a hand-inked linoleum carving. 2016. 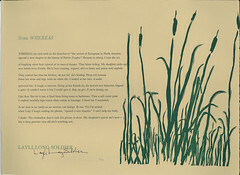 Edition of 27. Signed by the author! from Whereas by Layli Long Soldier. Printed from handset metal type on Rives lightweight natural paper with a linoleum carving. 2018. Edition of 57. Printed from handset metal type on Rives lightweight paper with a pressure-print. 2010. Edition of 150. Litany at the Tomb of Frederick Douglass by Martín Espada. Letterpress printed from hand-set metal type and photopolymer. 2009. Edition of 100.